Buy a Prague holiday package on Expedia today! This is one of the best ways to save time and money for your incredible getaway. Wouldn't it be nice to earn savings up to 16%*? Book your package deal on Expedia now! With more than 400 partner airlines and 321,000 properties to select from on our comprehensive database, you won't have any trouble planning your ideal holiday. Not 100% sure about your booking? There are no extra charges from us when you change almost any reservation. We've got all the sightseeing info you need for your impending trip to Prague. Grab your travel planner and get ready to start topping up that itinerary. If there's one attraction that captures the heart and soul of Prague, it's Charles Bridge. Remember to take a few snaps in front of this remarkable icon to show everyone back home. You're going to be surrounded by worthwhile sights, like Prague Castle and the Charles University. If you're dying to make the most of your urban adventure, also stop by the Astronomical Clock and St. Vitus Cathedral. Choose the best vantage point and observe the world go by at Wenceslas Square. If you feel like having a chin-wag, this time-worn public area is also a fantastic place to mingle with fellow travellers and locals. There's a fabulous range of things to do in this destination. Lennon Wall offers a respite for quiet reflection. Learn about the main features of this memorial and discover more about how, when and why it was erected. Still have time to spare? Wild about animals? Grunt, squeak and squawk along with some of the most impressive of them at Prague Zoo. It promises to be a fun day out for the young and young at heart! When we reminisce over our travels, we remember experiences rather than our nice hotel room and its view of the sea. Ready to start making some new travel memories? For more activities, head to our Prague things to do page. The excellent range of Expedia accommodations in Prague means that you won't be left out in the cold. That said — the sooner you book your room in the nation's capital, the sooner you can organise all your exciting activities. We have luxury getaways and cheap holidays for all kinds of travellers. After an exhausting flight, there's nothing quite like putting your feet up in a fancy room and treating yourself to some room service. See what delectable treats are waiting for you at the Four Seasons Hotel Prague (Veleslavinova 2a) or the Mandarin Oriental, Prague (Nebovidska 459/1). If you've done your figures and these don't suit your budget, don't worry — we've got some cheaper options. Check out the Unitas Hotel (Bartolomejska 9) and the angelo by Vienna House Prague (Radlicka 1g). 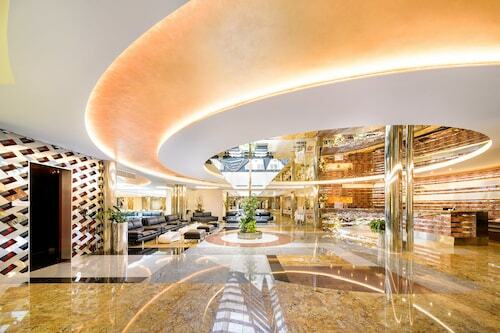 If you're just here for a couple of nights and only have limited time to check out the principal attractions, make a booking at the Augustine, a Luxury Collection Hotel, Prague or the Golden Well Hotel. They're both located near Charles Bridge. Vaclav Havel Airport (PRG) is the entry point for most visitors heading off on a trip to Prague. It's based 7 miles (11 km) from the heart of town. Attend an opera or ballet performance in this grand neoclassical venue, whose opulent auditorium features red velvet and beautiful gilding. Enjoy an aerial view over Prague’s Old Town and admire the city’s world-famous astronomical clock at this 14th-century Gothic tower. Admire art exhibitions and watch classical music performances at this neo-Renaissance concert hall, which is the home of the Czech Philharmonic Orchestra. Discover Czech ethnographical and musical history, art exhibits and African and Asian culture at this series of museums spread across Prague’s city center. Ideal for picnics and gazing over Prague’s historic Old Town, this riverside park is also home to a museum of modern art. Set within the grounds of Prague Castle is this lavish private residence, which houses an impressive art collection and hosts daily classical music concerts. Ascend to the observation deck of Prague’s tallest building, a 1980s TV tower whose exterior is adorned with distinctive sculptures of climbing babies. At the heart of Prague’s New Town is a pretty park with statues of famous Czech people and framed by historic buildings. Shop at a Christmas market, admire a striking 19th-century church and watch a performance at a one-time military theater at this attractive square. Admire the impressive facade or watch a classical music performance at this important religious site of the Hussite community in Prague. Tour a museum that recounts the lives of Jewish people in Czech lands and attend concerts at this magnificent Moorish landmark. Learn all about the fascinating history of the tower and the adjoining Charles Bridge by browsing the illuminating exhibition hosted inside this structure. Marvel at this equestrian bronze sculpture depicting the 10th-century Duke of Bohemia, who famously features in a well-known Christmas carol. Discover the storied history of this 14th-century building, the site of a famous incident that sparked a series of military battles. More than 10,000 plants grow across these gorgeous terraced gardens, which serve as a peaceful retreat from the busy city streets. Located in Prague 1, this luxury hotel is within a 10-minute walk of Palladium Shopping Centre, Municipal House Hall and Powder Tower. Mucha Museum and Old Town Square are also within 1 mi (2 km). Florenc Station is only a 3-minute walk and Namesti Republiky Station is 7 minutes. 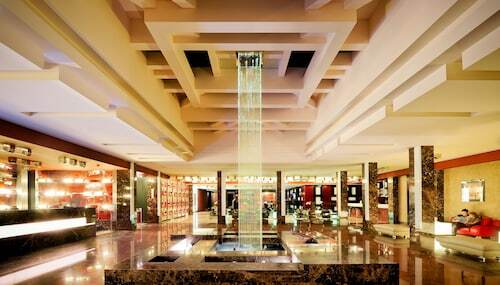 Located in Prague 3, this spa hotel is within 3 miles (5 km) of Eden Arena, Wenceslas Square and Astronomical Clock. Old Town Square and Dancing House are also within 3 miles (5 km). Zelivskeho Station is only a 3-minute walk and Flora Station is 15 minutes. 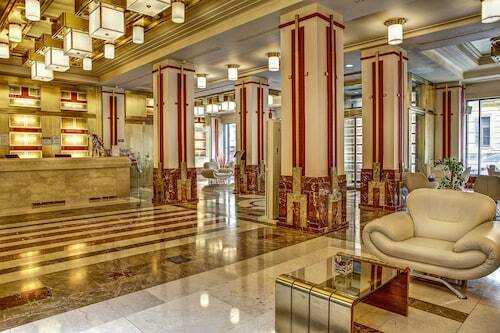 Located in Prague 1, this luxury hotel is within a 5-minute walk of Mucha Museum, Wenceslas Square and Jindrisska Tower. Museum of Communism and Old Town Square are also within 15 minutes. Muzeum Station is 5 minutes by foot and Mustek Station is 9 minutes. Located in Prague 4, this spa hotel is 0.3 mi (0.5 km) from Arkady Pankrac and within 3 miles (5 km) of Dancing House and Wenceslas Square. Vysehrad Castle and Czech National Museum are also within 3 miles (5 km). Pankrac Station is 6 minutes by foot and Prazskeho Povstani Station is 13 minutes. 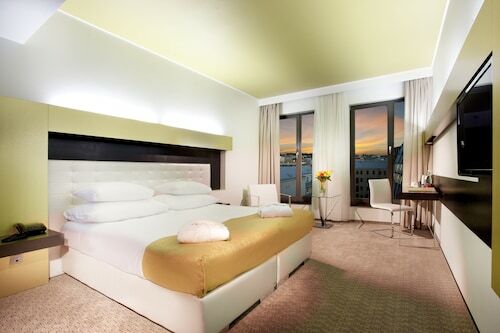 Located in Prague 1, this luxury hotel is within a 5-minute walk of Palladium Shopping Centre and Municipal House Hall. Powder Tower and Mucha Museum are also within 15 minutes. Namesti Republiky Station is only a 4-minute walk and Florenc Station is 9 minutes. 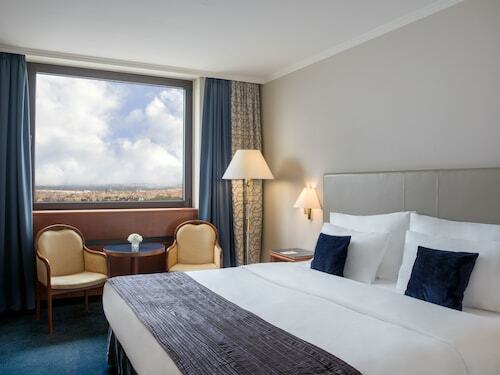 This family-friendly Prague hotel is located on the riverfront, within a 15-minute walk of Prague City Museum, Palladium Shopping Centre and Municipal House Hall. Astronomical Clock and Old Town Square are also within 1 mile (2 km). Florenc Station is only a 5-minute walk and Krizikova Station is 12 minutes. Located in Prague 1, this luxury hotel is within a 5-minute walk of Lucerna Palace and New Town Hall. Wenceslas Square and Mucha Museum are also within 10 minutes. Muzeum Station is 7 minutes by foot and Mustek Station is 8 minutes. 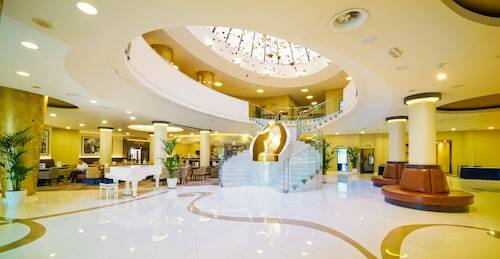 Located in Prague 4, this hotel is 0.3 mi (0.4 km) from Prague Congress Centre. Vysehrad Station is only a 4-minute walk and Svatoplukova Tram Station is 7 minutes.